AKIPRESS.COM - The flame that will burn during the 2018 PyeongChang Winter Games was lit at the birthplace of the ancient Olympics on Tuesday, marking a symbolic start of the torch relay that will involve thousands of people around the globe, Yonhap reported. With the first Winter Olympics in South Korea 108 days away, the flame for the PyeongChang Games was born at the Temple of Hera in Olympia, Greece, using a backup flame due to rain. It was the first time since the lighting ceremony for the 2000 Sydney Summer Games that a backup flame was used to kindle the Olympic torch. The Olympic flame is traditionally created using a concave mirror to focus the sun's rays. But with insufficient sunlight due to rainy weather, Greek actress Katerina Lehou, who dressed as a high priestess for the lighting ceremony, had to get the Olympic flame from a small ceramic pot containing a flame from Monday's rehearsal. 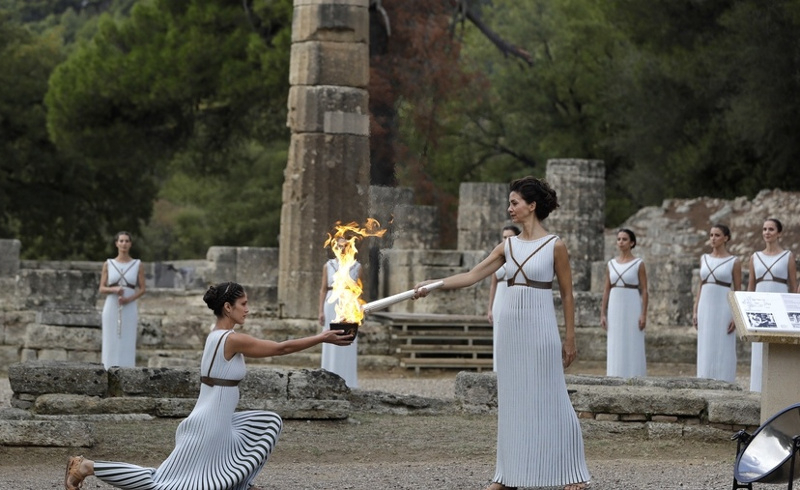 The IOC said the Olympic flame will take a tour of Greece for the next eight days with some 505 torchbearers covering 2,129 kilometers of Greek soil. The flame will be officially handed to the PyeongChang organizers at the Panathenaic Stadium next Tuesday. After the handover ceremony, the flame will travel 8,500km east to the South Korean port city of Incheon, arriving on Nov. 1 to mark 100 days to the Olympic Games opening ceremony.